List the chart of account numbers in beside the type of account. Can you please help me with the answer to how to number the Chart of Accounts? Thank you for your question about how to number the chart of accounts. 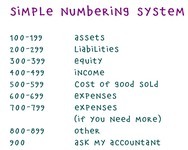 There are a few different number systems that can be used. I have included a picture of a simple numbering system in this post. Join in and write your own page! It's easy to do. How? Simply click here to return to Chart of Accounts Questions.